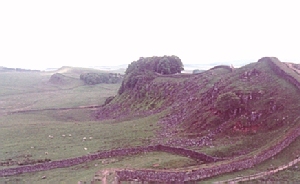 The island off the cost of Europe, which became known as Britain, became a province of the Roman Empire by the middle of the first century AD. While expeditions to Britain were begun first by Julius Caesar during the middle of the first century BC, no permanent Roman occupation of the island was attempted until the reign ofClaudius who launched an invasion with intent of conquest in 43 AD. His expedition deemed as success in Rome, he renamed his own son in honor of the event – Britannicus. The Roman policy governing the minting of coinage was strikingly different in the western provinces from that of the eastern half of the Empire. In the East, cities were allowed to continue their own individual coinage primarily in bronze as a sort of municipal issue. The legends were typically in Greek and often paid tribute to members of the Royal family as well as to loacl gods. The western provinces were subjected to Latin customs and the people were much more backward from a civilization perspective. Therefore, the coining of the money supply tended to be strictly limited to Rome and Lugdunum (Lyons). This gradually increased to several othet mints throughout Europe but never included Britain during the first and second centuries AD. In 286 AD, a Roman general named Carausius led a revolt and established his home base of operations at London. This marked the first the official Roman coinage to be minted in Britain. 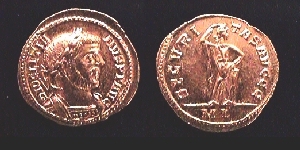 The above illustration is a Roman gold Aureus of Diocletian minted by the usurper Carausius in London, as distinguished by its mint mark “ML” on the lower reverse. This is the first Roman Gold Coin ever struck in Britain with a Roman Emperor rather than a mere usurper, such as Carausius himself. Following Carausus’ defeat by Constantius I, London became an official mint within the Roman Empire. However, the London mint was closed following the death of Constantine I The Great. Before then, the London mint struck coins in the name of 10 emperors or members of their families.